The UC San Diego Figure Skating team used its variety in skill sets and camaraderie among members to qualify and compete at the U.S. Intercollegiate Championships. On a Sunday afternoon, when most students are getting started on last-minute homework assignments or relaxing after a busy week, Astrea Villarroel-Sanchez and her friend Julianna DeContreaus are skating laps around an ice rink, punctuating their strokes with jumps and spins. Their blades make a scraping, sharp sound as they cut through the ice fluidly, carving edges in the ice as they go. They skate with their arms as much as their legs, holding them aloft like dancers and propelling their bodies forward. They both wear vests with “UCSD Figure Skating” embroidered on them. As part of the team, Villarroel-Sanchez and DeContreaus need to prep for the upcoming U.S. Intercollegiate Championships in figure skating. The two skaters practice their edges leading into their jumps, rapidly spinning at center ice with their arms above their head, and attempt jump combinations. They fall every once in a while, but are always right back up on their feet and launching themselves into another jump in no time — they have to forget what happened as soon as it does. At the end of the session, DeContreaus dons an orange sash to let the other practicing skaters know she’s about to run her program and then weaves around the ice to Latin music. All of this was part of preparation that Villarroel-Sanchez, DeContreaus, and the rest of UC San Diego Figure Skating had been engaging in all season long, which culminated in a trip to Denver for nationals. After placing third in the Pacific region qualifying competition, UCSD Figure Skating was set to compete with figure skating teams from the West Coast, East Coast, and Midwest. It’s a feat they haven’t accomplished since President Rachel Miller, now senior nanoengineering major from Earl Warren College, first joined the team. For many of its talented skaters, UCSD Figure Skating is an opportunity for its members to continue doing what they love, even after they’ve finished competing on the high school circuit. Skating in college gives them an opportunity to keep up with an activity that has always been important to them in addition to their academics. Villarroel-Sanchez, a sophomore cognitive and behavioral neuroscience major from John Muir College, is one example. Formerly an early-morning skater, she has learned how to adapt her practice schedule to her academic commitments. She skates for an hour to an hour-and-a-half, five to six days a week. Is Division 1 Worth the Cost? Another member, freshman Georgia James, an undeclared physical science major from Sixth College, started skating at the age of four at her local rink in Riverside and spent her fifteen years skating moving up to the highest level. 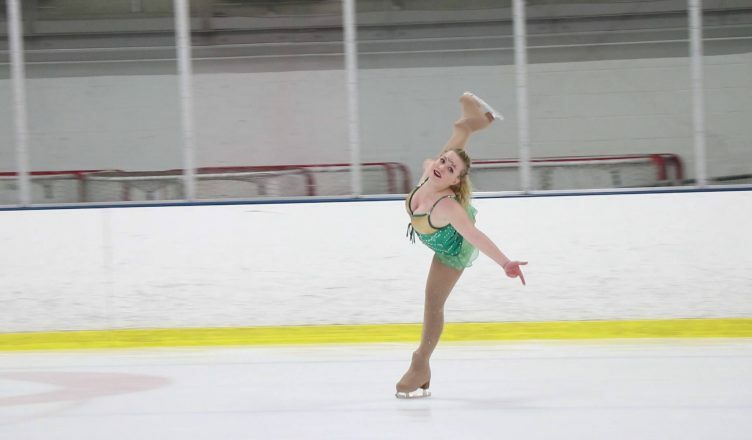 For her, the time commitment was always worth it, but she never thought she would be able to continue skating in college. UCSD Figure Skating has given her an opportunity to compete without being at the national or Olympic level. She values the emphasis UCSD Figure Skating puts on encouraging skaters of all backgrounds and skating levels to join the team. Miller, Villarroel-Sanchez, and James all express how strong the camaraderie between the skaters on the team is, particularly because the team travels to so many different competitions together. As Miller and James talk and laugh together, it’s clear how close they are and how well they know each other. Nationals was a culmination of the team’s months of hard work, which made it an emotional experience for some. For James, who has always struggled to find confidence in herself and her performance out on the ice, competing with UCSD Figure Skating at such an important event gave her a new outlook on what she as a skater is capable of and reminded her not to compare herself to others. James, an avid musical theater fan and theatrical performer herself, chose a piece of music from “The Lion King” musical for her short program after seeing the musical on Broadway with her mother. Her face lights up as she describes her love of “How to Train Your Dragon,” which led to her to choose the compilation of music from the sequel for her program. Miller, who funded all of her own skating endeavors in junior high school and high school purely because she loved to skate, had few chances to compete before joining UCSD Figure Skating. The way all the skaters earnestly discussed their years of training, it was clear that the activity was a major part of their lives. It was very hard for Miller to imagine that she could give up skating after high school, seeing as it had been the center of her life for so long. Villarroel-Sanchez, James, and President Miller all see a bright future for UCSD Figure Skating, which ended up finishing tenth at nationals. James knows of a few skaters from her hometown rink who are attending UCSD next year and plan to join the team. What with many skaters graduating this year, recruitment and finding new members is of the utmost importance. Experienced skaters and beginners are both equally welcome, as all three skaters believe diversity in skill level is part of what makes UCSD Figure Skating so successful. Photos courtesy of UCSD Figure Skating Team.